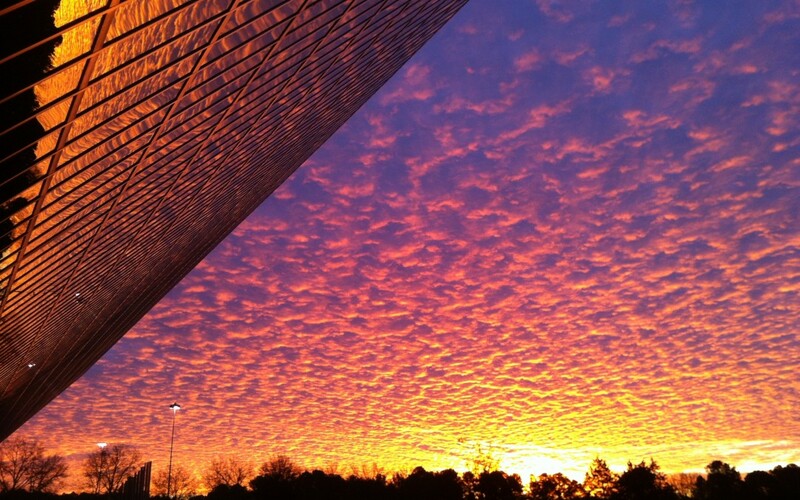 Like the company itself, our iconic Headquarters building has a history woven into the state of North Carolina. If you know Durham and Chapel Hill, you know this building, and you’ve probably used it as a landmark to give someone directions. Or you’ve at least been curious about this rhomboid-shaped structure that’s been compared to a spaceship, a landing strip, or even confused as a rest stop. It’s a unique and beloved building we will be saying goodbye to, after 43 years, this June. It was sold last year to NC State Employees Credit Union, and by the end of June, all Triangle-area Blue Cross employees will be in the consolidated campus in Durham, throughout nine buildings. To talk about this iconic building, let’s start with a history lesson. Blue Cross and Blue Shield of North Carolina was founded back in 1933, but as two separate companies — Hospital Care Association and Hospital Savings Association. In 1968 these two rival companies consolidated, and plans for a new home office building were launched. The building sits right on the Durham and Orange County lines, on former farmland (it’s been said the farmer sold the land because he couldn’t figure out how to get his cattle across the increasingly busy road). Being right on two county lines was symbolic because that represented the joining together of Durham-based Hospital Care and Chapel Hill-based Hospital Saving Associations, after more than 35 years of competition. It meant a fresh start. Construction began in 1970. Odell Associates, Inc. of Charlotte was the architectural firm, and the builder was the Nello Teer Company of Durham. 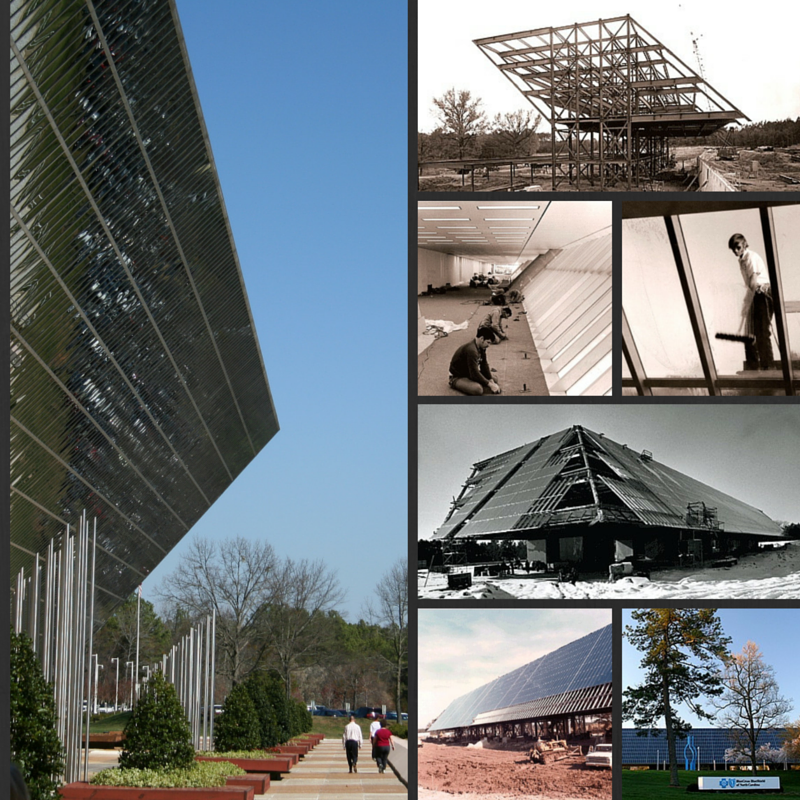 The rhomboid design was ahead of its time, with passive solar design principles, and nearly 5,000 panes of angled, reflective glass to minimize traffic noise and heating and cooling needs. It was a “green building” before that was a thing. A.G. Odell himself was a noted Midcentury modernist architect. Over the years the building has been featured in the New York Times Magazine, Time, Newsweek, and design exhibits at New York’s Museum of Modern Art, as well as a Toyota advertisement. Architectural students from N.C. State came to study it, being one of the few rhomboid-shaped buildings in the world. The blue sculpture in front of the building that sort of looks like a computer circuit is called the “Triune Towers,” and the three shapes symbolize the working relationship between Blue Cross, our members, and health care providers. The Triune Towers will eventually be joining us over on the new campus. I’ve worked in this building for the better part of a decade, on and off. In a few weeks my team will be moving to a newly renovated building down the road that is modern, bright, airy, and with open workspaces, meaning you can sit wherever you want. I’m excited, but also a bit nostalgic about leaving behind this spaceship-looking building, with its wooded walking trail around 40 acres, its cafeteria where I ate my way through my second pregnancy, and my little beige cubicle. Everyone seems to know where I work when I say Blue Cross, and I’ll certainly miss that. A while back we called out for employee stories and memories of the building, and we received some that made us smile and laugh out loud, and a few that brought tears to our eyes. We heard about everything from starting labor (as in, the giving birth kind) in the building, to bittersweet memories of a son learning to ride a bike in the building’s parking lot, to a hilarious episode with the carpenter bees that frequent the planter boxes under the building. Employees remembered the “bell” that rang at the start and end of every work day for decades, and when you were allowed to smoke in the building (yuck). They remembered the employee “tour guides” that up into the 1990s gave the curious public a glimpse into the building. They remembered how the wind under the building’s breezeway could rip you nearly in two on a cold winter morning, and the resident Canada Geese with their fuzzy little springtime babies. This building has worked its way into the hearts of Blue Cross employees, past and present, and while we’re exciting to move on, we’ll miss it. And we’ll certainly miss taking pictures of it, too. A look at the iconic headquarters building here at Blue Cross and Blue Shield of North Carolina. Pictures through the ages.